You may not know the name Cam Elkins, but there?s a good chance you?re familiar with his work. He?s the man behind the brilliant short films called Stories of Bike, which explore the relationships between custom motorcycles and their owners. After several years filming other people?s bikes, Cam decided it was time to get a custom of his own. 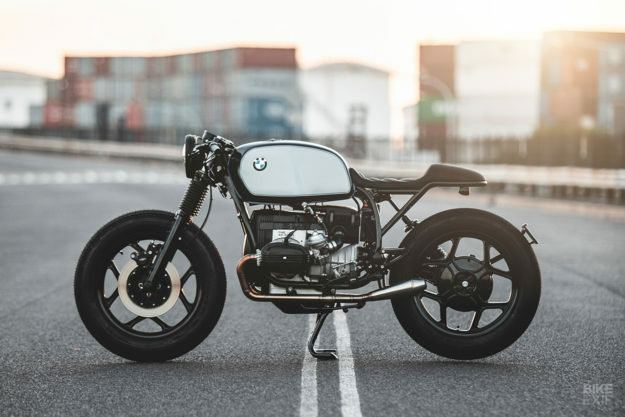 He selected a 1986 BMW R65. ?I’ve always loved boxer engines,? he tells us. ?I think they’re reminiscent of old WW2 airplanes, which had such a sleek but utilitarian look to them.? ?And when I first got into the cafe racer scene, it was the custom R80s and R65s that tended to catch my eye. So in short, it’s been a dream for a long time.? The R65 is a wise choice for a custom from the R series. It?s light, the handling is quick, and steering stability is good?thanks to a beefy upper triple clamp. So it?s the perfect airhead for twisty roads, especially if it?s a post-?85 model with the monoshock configuration. Cam got to know Jason Leppa and technician Sean Taylor at Gasoline while filming a promo video for their custom Harley Sportster, the A-15. So when he?d saved up enough to buy the R65 and put some money toward customizing, he knew whom to call. ?I knew Gasoline would do a great job, having seen their custom work up close.? So Cam delivered the BMW to Gasoline?s workshop in south Sydney, Australia. And as a style guide, he pointed them towards a super-clean R80 from the Spanish shop ROA. ?The brief was to build a forever bike,? says Gasoline?s Jason Leppa. ?One with timeless style and clean lines, with modern controls and handling.? Gasoline have absolutely nailed that brief, and delivered one of the cleanest looking R-series BMWs we?ve seen. There?s not a line out of place, or a sliver of pipewrap?and even the 18-inch cast alloy wheels look good. To counter the age of the R65, Gasoline started by dismantling the original engine and gearbox. They vapor blasted and rebuilt the drivetrain with all new bearings, seals and gaskets, and then restored and powder coated the final drive unit. The carbs were overhauled too, and new jets installed to match the improved breathing: there?s a DNA filter upstream, and a custom-made 2-into-2 stainless exhaust system, with a balance pipe between the cylinders. The get the stance right, the front suspension has been lowered 40mm and the rear raised 50mm, with the help of a new shock. There?s a new top clamp from Retrofit Collective, which fits neatly with a headlight bowl mount and fork brace from TinWorks. Purpose Built Moto supplied the small profile headlight (and control unit) to complete the modern retro aesthetic. Gasoline added clip-on bars, with Beringer hand controls and switch blocks (and brake calipers). Motogadget supplied the speedometer, grips and m.view mirrors?which have a polished aluminum rather than glass surface. And there?s more German engineering in the shape of discreet Kellermann brake and signal lights.